Destinations picked and the reservations have been made. Maybe you plan on soaking up some rays? Perhaps you’d rather play in the snow? Wherever your next vacation takes you, leave the stress of packing to us! 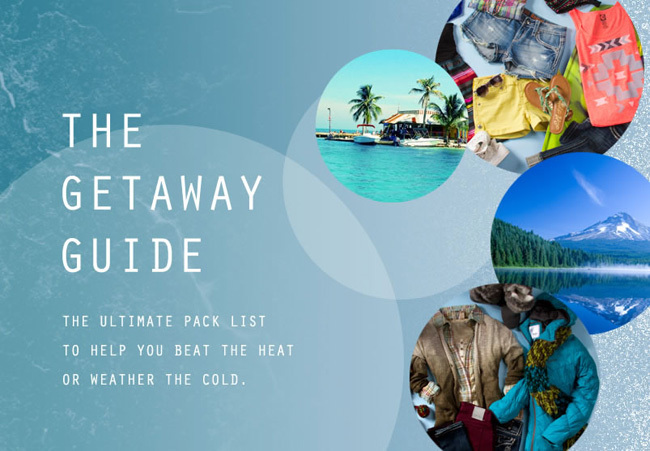 Gals, we’ve crafted a no-fail pack list, The Getaway Guide, that’s sure to make any vacation memorable. Heading for some fun in the sun? We’ve put together several categories from swimwear to wovens and spring dresses as cover-ups. No vacation would be complete without some sunglasses and flip flops! For those of you wanting to hold onto winter for just a tad longer, no worries! We’ve got you covered head to toe. Check out our selection of sweaters, coats, and boots from some of your favorite brands like Columbia and Bench Outerwear made especially for bearing the cold. Guys, packing has never been so easy! 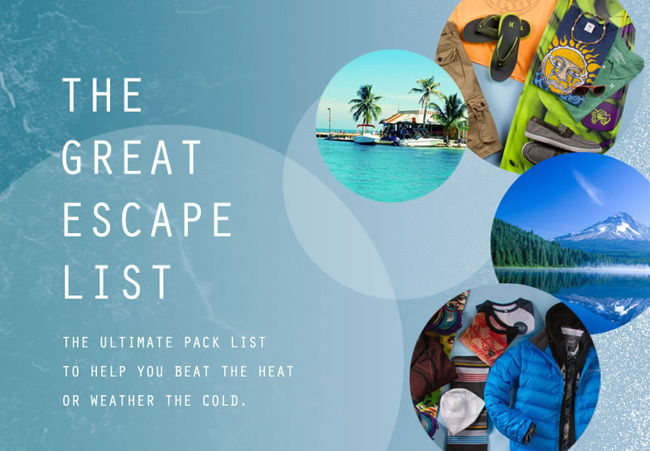 Find everything you need in The Great Escape List. For those warmer destinations, our stylists have picked out a great selection of boardshorts, tanks, and hats by your favorite west coast brands such as Hurley, Billabong, and Oakley! Going snowboarding or skiing? Layer it up with our long-sleeve tees, hoodies, and coats to lock in the warmth while you’re shreddin’ it on the slopes! Whichever location you choose as your great escape, Buckle has you covered to look good and feel good no matter what the weather forecast has in store! What’s Your Fave Spring Look?